David & I had a picnic out at Bottomless Lakes State Park on the east side of Roswell for Mother's Day. This is a very nice park. The weather was nice but the breeze had a bit of a chill to it. This is a great area for hiking. 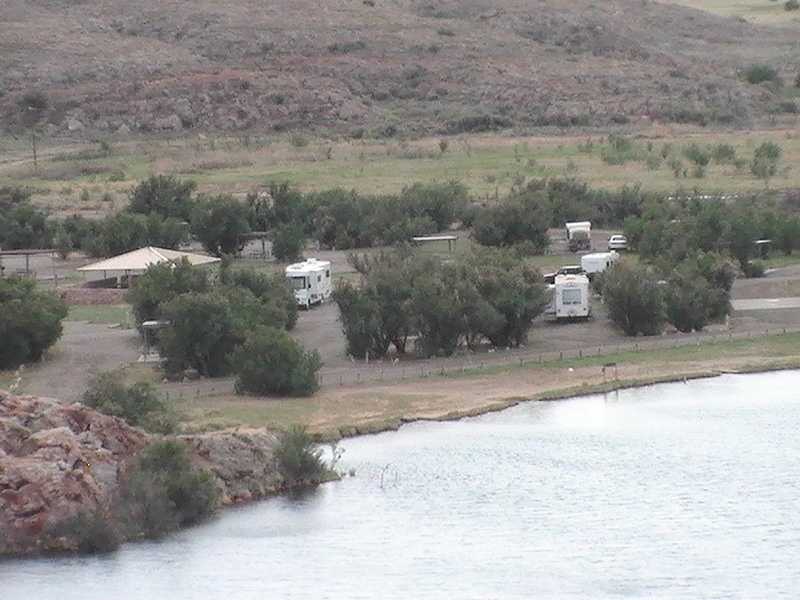 It has a nice lake to swim in with a nice little sandy "beach" are next to the level campground. Very short walk for the kids or those of us who are lazy. It is a bit out of town (12 miles plus the 5 miles to the campground) so you would want to bring everything with you. It's a long way to town just to get a bottle of ketchup. 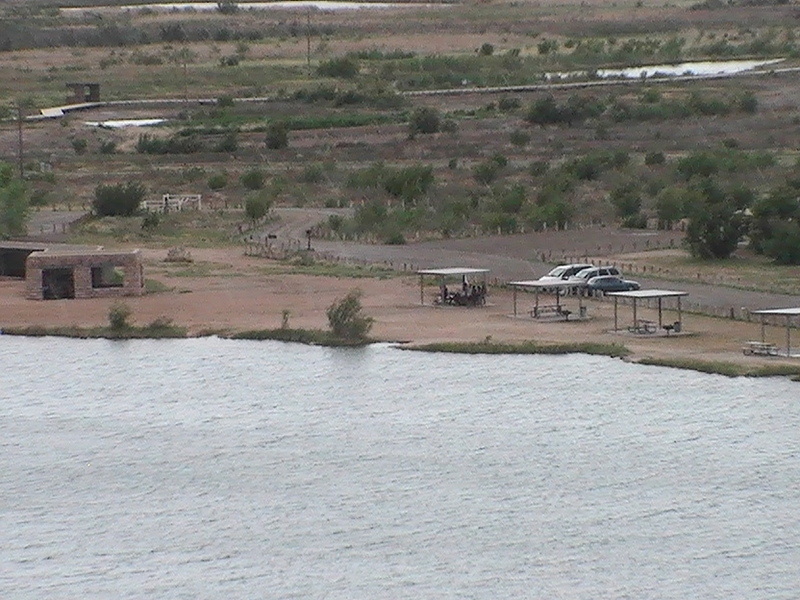 I'm not sure how much use the campground gets but many of the sites are able to be reserved. 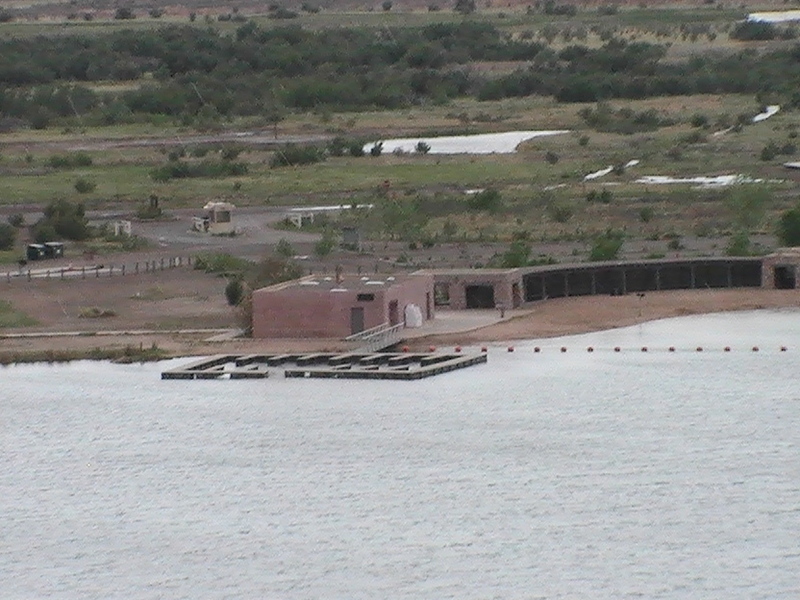 Most of the sites are electric/ water ($14) and there are some with full hookups ($1 as well. They have the price of the site on the canopy over the picnic tables next to the site number. On site campground host (site #1) and have a self pay kiosk as you come into the campground. That means cash payment. Bath house (ladies side) had flush toilets and (3) cold water showers. The water was most definitely COLD. Good water pressure in the bathhouse but did not check at a site. Pretty clean. There had been several campers there over the weekend. We got the impression there was plenty of sites open though. Nice playground on the other side of the lake in the Day Use Area. Again, easily walkable. Signage said check out was at 2PM. We could fit our 40 ft bus into most of the sites (with a few exceptions). The shorter sites could be managed because we would back the bus in until the rear wheels hit the end of the pad. We have a 10 ft overhang. I made a list of sites we felt would not be good sites for us (too short in the "front" or tough to maneuver into): 8, 9, 10, 11, 12, 13, 19, 20, 21, 22, 23. Sites 28 thru 32 are tight but doable. This was a Blue Bird Wanderlodge that was in site 29 (if I remember correctly). Based on it, we felt that we could just fit our bus in the site (the Wanderlodge was shorter than our bus but was hitched to a cargo trailer which hung out in the drive a little). There is a road both front and rear (it's a pull thru site). We would take up every inch of the site front to back. I would not be real comfortable with that unless it was in the winter when the campground is probably deserted.31 & 32 are the "short" sites in the pull thrus. We don't need a pull thru, Both of us can back the bus into a site. The pads are wide so we would have no problem parking the Jeep next to the bus. Sites 24 (handicapped) thru 27 are terrifically long. You can put a 40 ft bus plus a couple more vehicles in the site. I'm sure the folks hauling fifth wheels love those sites. Once we are able to get the bus on the road, we plan on making a weekend trip to this park to make sure everything is okay before we make a trip down to Carlsbad. We think this is a nice little park. Only downside we have seen, is the water... it is heavy on the minerals. The shower heads are simply caked with lime. All the water has lime in it in Roswell, but not this bad. Still you can only stay for 14 days. unless you are using a tankless water heater without a softener, I doubt any harm will occur to your water heaters and pumps. While it is higher priced than our "base" of $13 - $14 per night (usually achieved only with a monthly rate), it is low enough that it falls within our "on the road" price range. We feel 2 or 3 nights in a parking lot then 1 or 2 nights in a low priced campground to refill fresh tanks and dump waste tanks tends to average out. Although this stay (and the one in Carlsbad to visit the caverns) will not be counted. It will be mini vacations. Destinations that are close enough to our home base that we can lease as soon as I get off from work (8AM on a Friday) and get to our destination, play tourist, then get back in time for me to get enough sleep for work on Monday (up at 3:30AM). Still cheap though. And a short enough stay we do not have to be on sewer connection. Public parks that are open year round are great destinations in the winter. After Labour Day, they all pretty much empty out even though they are still open. Even the late season ones are almost deserted. Some of the year round ones will shut the water off though. Gotta watch for that. Great writeup. Thanks for the info. Good to hear it will be empty after Labor day, since I've pushed back my departure until that weekend. Hopefully I won't have to push it back any more than that or I'll be cold weather camping at higher altitudes. On Hwy 60 west of Socorro (I25 Exit 147 & 150)... You need to hit Pie Town. The "city" park is free (you need take a gas powered weedeater or a sling blade because the grass is hip high), No hookups/no showers/pit toilet tend to locked closed but 1 hose bibb in the field. Can also get water from the nearby Fire Dept I believe. 1 Private park on west end of town, has a dump $tation . 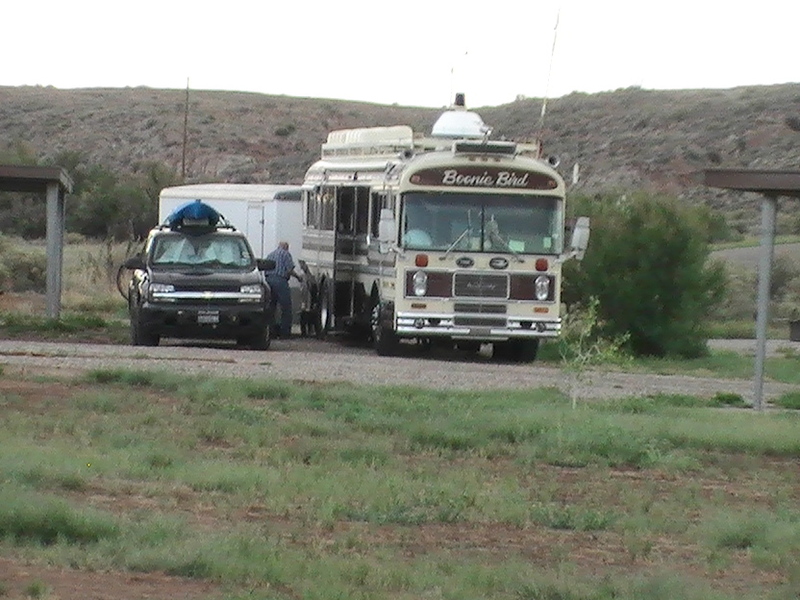 Just before you get to Pie Town is Datil Well Recreation Area (BLM $5 per night). Datil Well has pit toilets and water pipe stands (several in the small campground). WHY would you head up to Pie Town other than to get PIE (get it at the place on the West end of town... TRUST ME ON THIS!!!!!)... Between Magdelena (a gas station and very little else) and Datil (even less than Magdelena but still fuel/convenience store and a really good steak restaurant) is the Very Large Array My daughter went and picnicked up there, toured the site... pronounced it "uber cool"
...The VLA is the setting for the beginning of the 1984 film 2010. .. For the 1997 film Contact, much of the outdoor footage was shot at the VLA site with the number of dishes visible on screen artificially increased by CGI, and the canyon depicted as being in the vicinity of the VLA is actually Canyon de Chelly in neighboring Arizona. ... In the 2009 science-fiction film Terminator Salvation, the VLA is the location of a Skynet facility. At the beginning of the film the site is attacked by Resistance forces. ... New Jersey rock band Bon Jovi shot the music video for "Everyday", at the VLA and a "dish" can be seen on the cover of the album Bounce. Likewise Matt Harding can be seen dancing at this location in his second video. ... The cover for the Night Ranger album Dawn Patrol, the Dire Straits album On The Night, and the At the Drive-In album In/Casino/Out feature the VLA. ... The VLA featured prominently in Carl Sagan's 1980 documentary Cosmos: A Personal Voyage. ... The VLA features in plans to save the world from satellites being pulled from orbit in the second volume of the comic book series G.I. Joe: America's Elite published by Devil's Due. ... The VLA could be visited in Auto Assault, a massively multiplayer online game that was set in post-apocalyptic America. I will post reviews on those two campgrounds as well tomorrow.